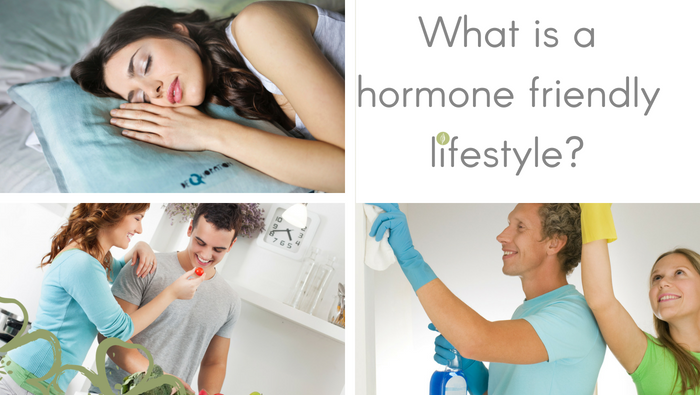 What is A Hormone Friendly Lifestyle? I’m like a stuck record I know. Everywhere I write, speak or post, I’m banging on about a “Hormone Friendly Lifestyle” for women. Why should you give two hoots, anyway? How can you get one? Pronto. You can’t do much about the genes that you got from your parents. You CAN influence whether those genes get “switched on” or not. You can do that with diet and lifestyle. The science is called “epigenetics”. A hormone friendly lifestyle is making choices that support good general health and balanced hormones… whatever you inherited from your folks. So you can live a longer, happier, healthier life. And reduce risk of illness. The same follows that if you live a really healthy lifestyle, you’ll pass healthier genes to your children. That’s got to be worth it, right? Eat good quality protein, essential fats, wholegrains, fibre and lots of veggies and some fruit. Avoid processed foods with additives, preservatives, GMOs and other nasties. Choose organic, unsprayed and “wild” foods. Reduce or avoid sugar in all it’s forms. Ditto those yucky trans fats. Supplements are an individual thing. It’s likely that many people will lack Vitamin D in the Northern Hemisphere in winter, because we make it from sunshine. In the UK, soil now has a low selenium levels so many of us will have deficiencies. It’s better for health to choose cookware and food storage that is made from natural substances – cast iron, steel, wood, glass, china. Other materials like copper and aluminium pans or teflon or plastic wrap can leach into food. Microwaving changes the structure of food. Drink plenty of filtered water and herbal teas. Don’t drink things from plastic bottles – they are quite likely made from BPA, which is a hormone harmer. Reduce or avoid caffeine and alcohol. It’s important to be the right weight for your height and build. Body Mass Index can be a useful indicator although it’s possible for a healthy and fit person to have a high BMI. Percentage body fat is a really good measure. Where fat is stored is also important. Carrying fat around the middle is more risk to health than being “pear shaped”. …to smoking and street drugs. No brainer. Get plenty of good quality sleep. I mean sleep, not just rest and relaxation. Try to get 8 hours a night. Take regular, gentle exercise – at least 30 minutes per day. Varying exercise makes good sense. So that you are raising your heart rate, burning fat, toning, strengthening and improving flexibility. Do something that’s fun and easy to fit into your life, so you stick with it. Take care of your health, generally. Speak with your Doctor if you suspect any general illness, infections, allergies and intolerances, parasites, injuries etc. Meds do come with risks and side-effects. Choose wisely. They can deplete us nutritionally in time. So we develop symptoms of nutrient deficiency. And we might end up with MORE meds to treat those…when we actually need better nutrition. Artificial hormones from contraceptive pills, implants, HRT have risks, side-effects and lower nutrients. They also interfere with natural hormones and cycles. Some women using hormonal contraception say that it can take time for their cycle to settle down when they stop using it. There are toxic, health-harming substances in our food, the air we breathe, tap water, the stuff we use to clean our homes, new carpets/furnishings are more, the cosmetics we put on our faces/bodies/hair, the preparations we put on our pets and in the things are use to make gardens grow and kill off weeds/pests. They can be harmful to us and our environment. Choose organic/natural/eco friendly or reduce use. You know about my addiction to all things Neals Yard for cosmetics, toiletries and more, don’t you? Organic and gorgeous stuff. Safe for us and the environment too. Long term and chronic stress can really damage health – physical, mental and emotional health. It’s best to manage the cause and not just the symptoms. It’s now widely believed that sunbeds are bad news for skin and x rays and other body scans should be used as really needed. Some also choose to be careful about new technology, where there are no very long term studies available e.g. mobile phones. So that’s it – a healthy, hormone-friendly lifestyle. The basics to protect or boost your general health and fertility. P.S. Blog contains affiliate link.